Among fallen flags, the Missouri Pacific carried the least sentimental value for me when I was photographing it. Perhaps this was because the towns in which I grew up -- Chickasha and Oklahoma City, Oklahoma -- were served by the Santa Fe, Frisco, Rock Island and Katy. 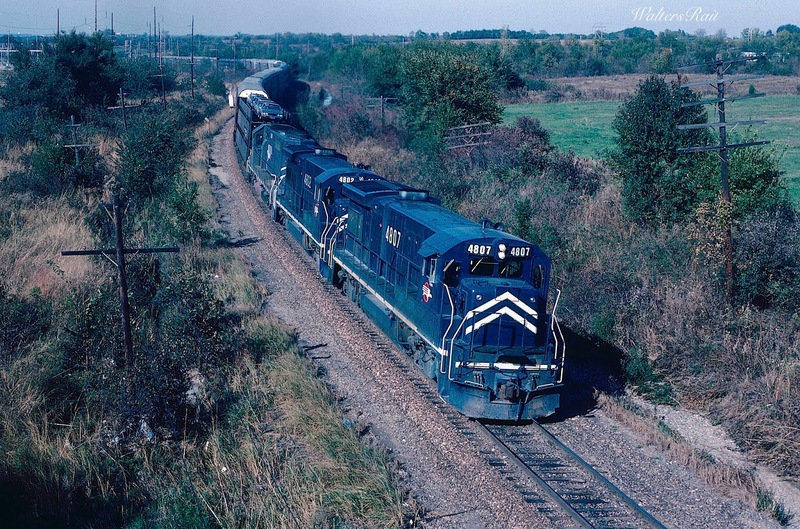 Perhaps it was because, at least when I knew it in the 1970's and early 1980's, the MoP was always a first class railroad, with excellent, well-maintained roadbed, rolling stock and motive power, while my interests ran toward railroads like the Rock Island, hanging on by rapidly unraveling threads. Perhaps it was because, to me at least, the MoP always seemed like an adjunct to the Union Pacific, even though I knew the railroad had its own corporate identity and headquarters in St. Louis in a stout high-rise that looked, with faded white façade and overbearing cornices, like part of the old Bell System. I worked in St. Louis for several years, after the UP had taken over, perhaps justifying my earlier opinion, and I often walked past the building on my way to lunch, where I would sometimes stop and chat with railroad employees, many of whom had worked originally for the MoP, all of whom mourned the fallen flag. But not me. So I was most surprised when I started reviewing my slides for this post, many of which I had not looked at in about 30 years. What do you know: I actually began to feel nostalgic. Absence really does make the heart grow fonder. Cliches really do show up in the oddest places. If the Rock Island was the Prodigal Son, the Missouri Pacific was the rock solid child who never gets into trouble, never embarrasses the parents, never makes anything but good grades, and therefore is often unjustly ignored. Perhaps I can make amends with my belated tribute. 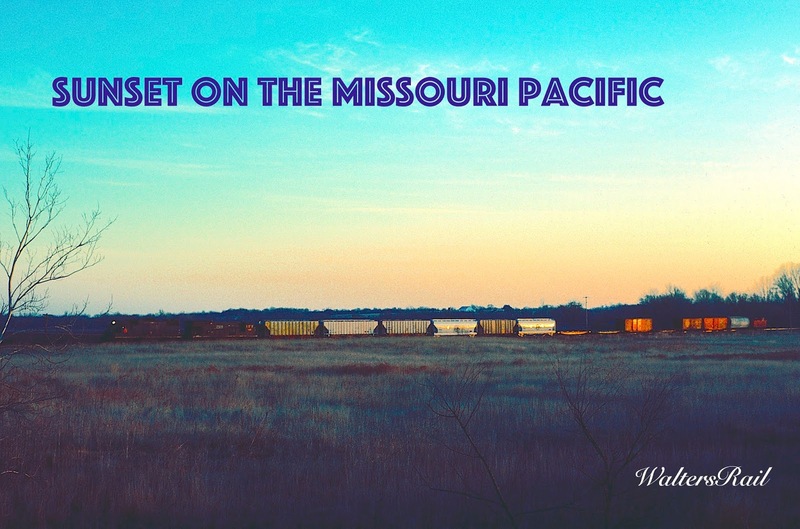 The modern Missouri Pacific was composed of a number of smaller railroads. 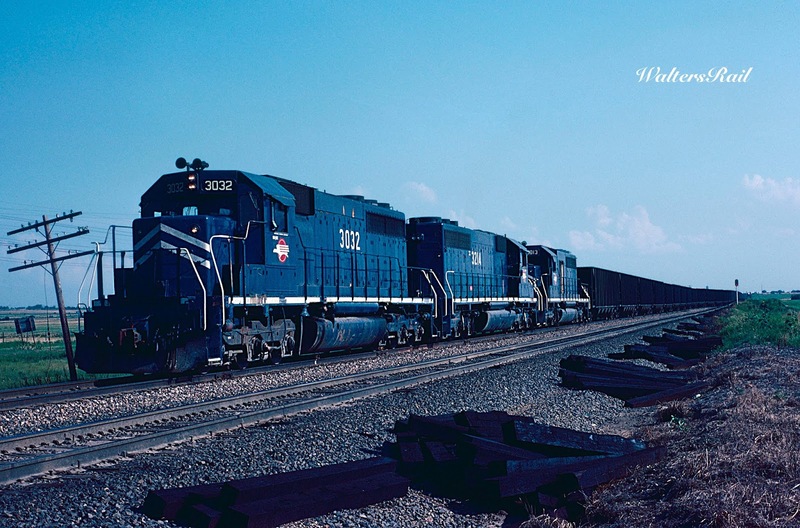 Originally chartered as the Pacific Railroad, the company's goal was to link St. Louis with the Pacific coast. Ground was broken in St. Louis on July 4, 1851. The first five miles of track were opened in August 1852, and the railroad reached Jefferson City in 1855. Construction then proceeded in fits and starts until interrupted by the War Between the States. The railroad reached Kansas City in 1865, went broke, was placed under the control of the State of Missouri in 1866 and shortly thereafter sold. In 1879, the railroad was purchased by Jay Gould and became part of his Southwest System, which also included the St. Louis, Iron Mountain and Southern; Texas and Pacific; International and Great Northern; and the Missouri, Kansas and Texas. The Missouri-Pacific reached Omaha in 1882 and Pueblo in 1887. In 1888, however, due to a financial panic, the Texas and Pacific filed for bankruptcy. Gould was thereafter forced to divest control of first the MKT., then the I&GN. In 1896, Gould passed control of the remaining railroads to his son George, who set about acquiring properties as voraciously as had his father. By the early twentieth century, the younger Gould had completed construction of the Western Pacific, while acquiring control of the Denver and Rio Grande Western; Wabash; Wheeling and Lake Erie; and the Western Maryland, effectively giving him a transcontinental railroad. George Gould's empire, however, as was his father's before, was blown apart by another financial panic, as well as low traffic on the Western Pacific, and in 1917, a new company was formed from the Missouri Pacific; St. Louis, Iron Mountain and Southern; and a number of much smaller companies. Afterwards, the International-Great Northern joined the MoP again through bankruptcy in 1925. In 1928, the company constructed a 22-story headquarters building in downtown St. Louis. That same year, the MoP again gained control of the Texas and Pacific after the latter's bankruptcy. 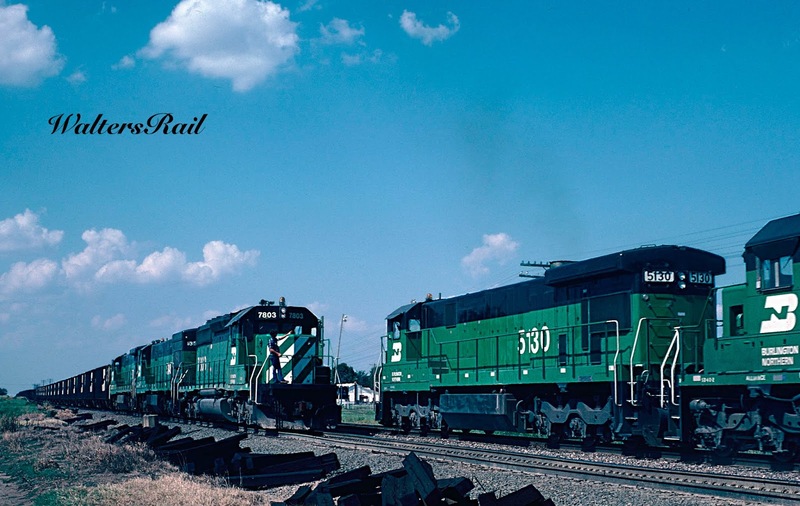 The company's Official Guide segment listed the following railroads as portions of the Missouri Pacific system: New Orleans, Texas & Mexico; Beaumont, Sour Lake & Western; Orange & Northwestern; St. Louis, Brownsville & Mexico; New Iberia & Northern; Houston & Brazos Valley; International-Great Northern; San Antonio, Uvalde & Gulf; Sugar Land Railway; Rio Grande City Railway; Asherton & Gulf; San Antonio Southern Railway; Asphalt Belt Railway; Iberia, St. Mary & Eastern; San Benito & Rio Grande Valley; and finally the Houston North Shore Railway. The Texas and Pacific enjoyed a separate listing. The stock market crash of 1929 shoved the company once again into bankruptcy. You may ask, "How many times can one company go in and out of bankruptcy?" The answer is -- a lot. However, when the MoP emerged once again from reorganization (in 1956! ), it began its transition to one of the most profitable railroads of the mid-twentieth century. It gained control the Chicago and Eastern Illinois in 1967, providing entry to Chicago. 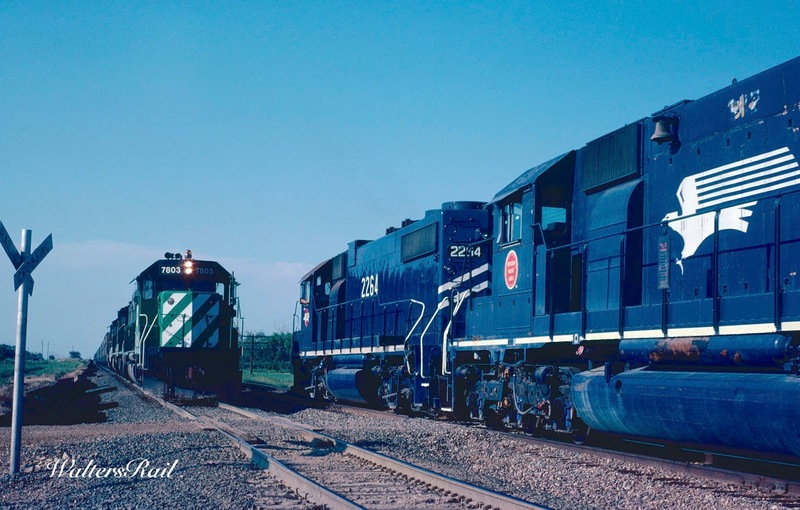 A few years later (1976), the company merged the C&EI and the T&P into the Missouri Pacific, giving the railroad a network of about 12,000 miles. The Union Pacific takeover awaited in 1982, at which time the MoP actually had more mileage than the UP. What follows is a photo essay showing locations where I was able to obtain photographs of the MoP from the early 1970's to shortly after the UP swallowed it, when it was still possible to find lash-ups of all Missouri Pacific power. 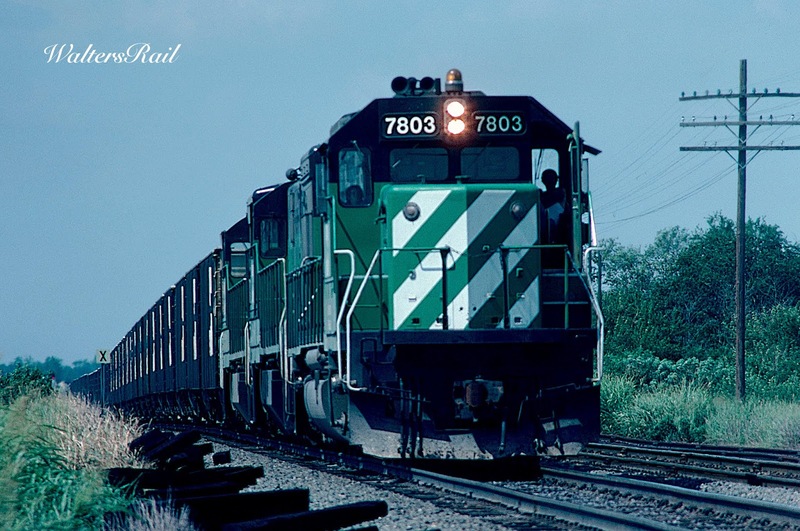 In Oklahoma, I had access to segments of the MoP that saw few rail photographers. 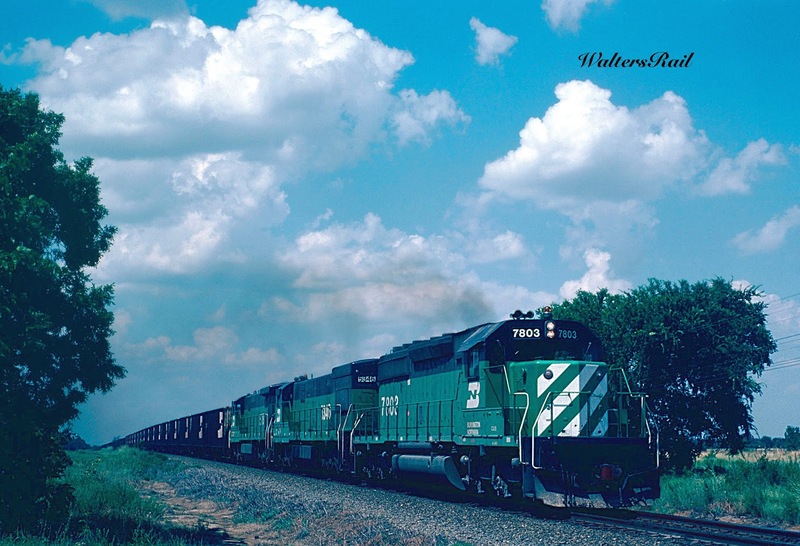 One memorable day in July, 1981, I was chasing a loaded coal train south (with BN power on the point) from Coffeyville, Kansas, on the Wagoner Subdivision. 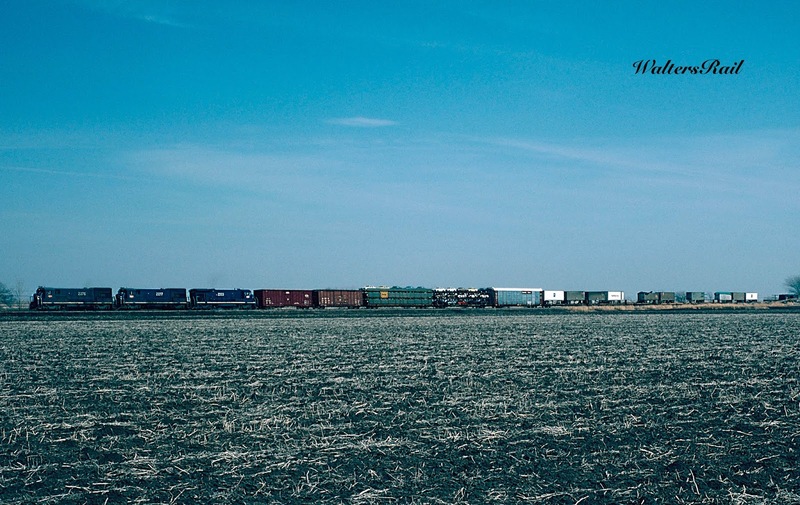 The train stopped on the mainline in the small town of Lenapah, Oklahoma, about 20 miles south of the state line. A short time later a northbound empty coal drag (also pulled by BN power, common on MP coal trains in those days) passed it on the siding. After the meet, however, the southbound did not move. Instead, it remained motionless on the mainline. About 30 minutes later, another empty coal train, this time with four MP units, came up from the south and stopped short of the south siding switch. 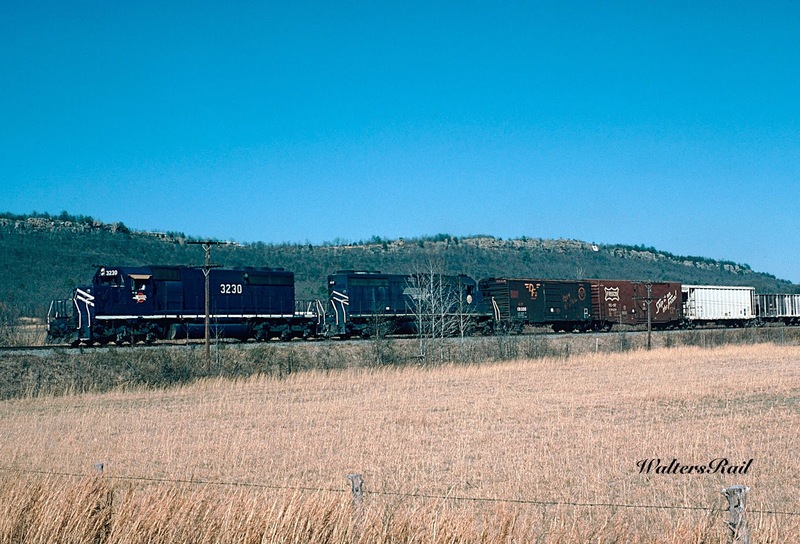 Immediately behind was another northbound, with a single autorack, two miscellaneous cars and about 80 empty coal cars. This train pulled forward until its lead unit was within a foot or two of the caboose of the northbound coal drag. 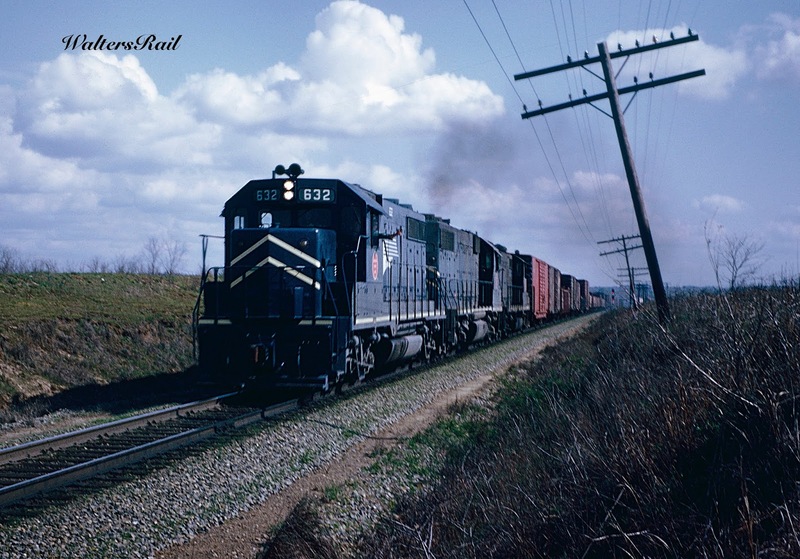 Here is the southbound coal train approaching Lenapah. Here is the same train stopped on the mainline. The northbound empty is approaching on the siding. The two trains meet in Lenapah. The third northbound slowly approaches the stopped coal train. The third northbound is now stopped about six feet behind the caboose of the motionless coal train. 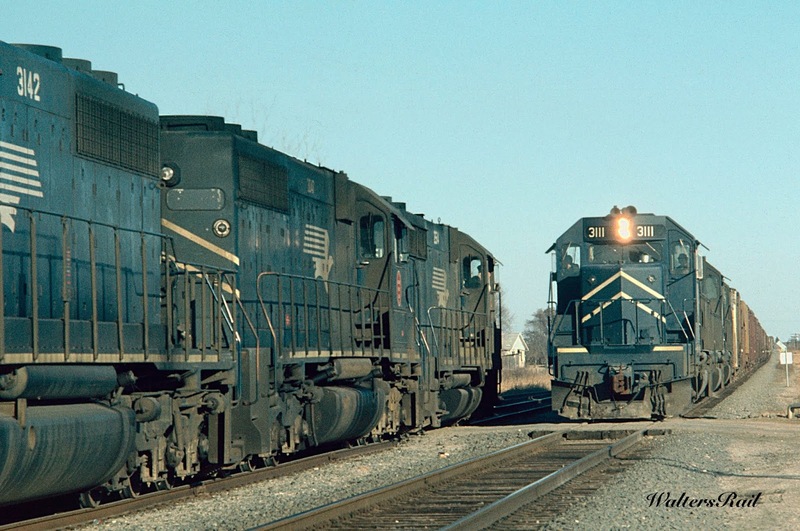 The three BN units on the southbound coal train then detached from their train and rolled southward on the mainline. They approached and then attached to the first three MP units on the northbound coal train. Then the three BN and three MP units pulled north and entered the siding. At that point, the single MP unit still on the northbound coal drag detached, rolled north on the mainline and stopped. Then the three BN and three MP units rolled south out of the siding, and the remaining three MP units attached back to their original train. The three BN units then rolled north again and attached to the single MP unit that had stopped on the mainline. Then all four units on the mainline rolled north and attached to the original southbound load. Clearly, the southbound needed additional power for the trip south, perhaps because one unit of the original power was not loading. 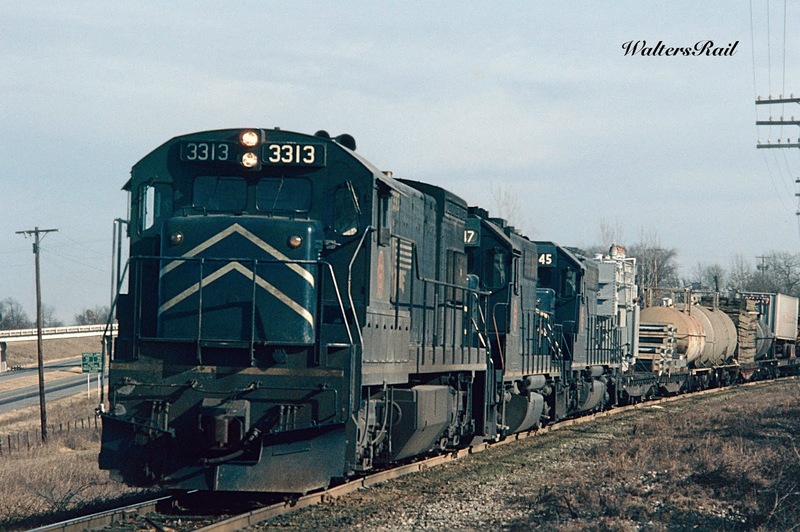 The three units of the original southbound coal train have detached and are heading south to pick up three units from the northbound coal drag stopped on the mainline. All six units will then head northbound into the siding. The three units from the original southbound coal train are now backing north on the mainline with the MoP unit that has transferred from the northbound coal train. Soon all four units will attach to the southbound. 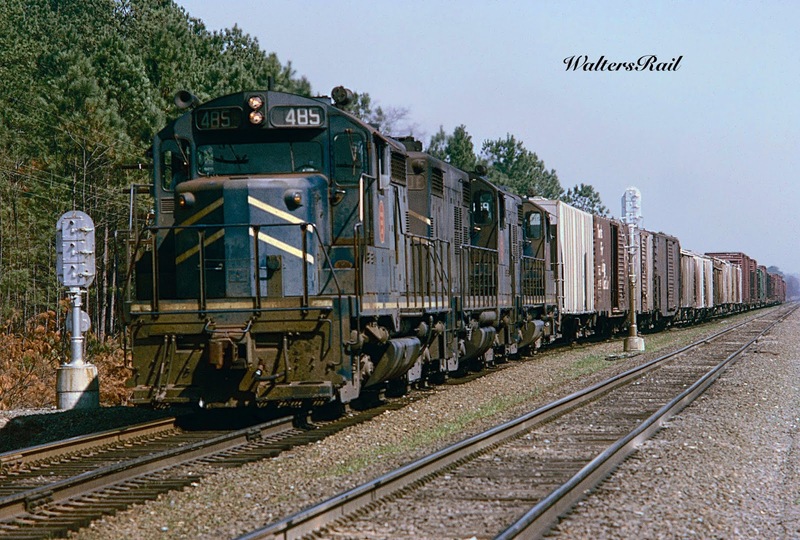 The result of all this maneuvering was that the southbound coal load added to the rear of its power the rear unit of the northbound drag, which now had only three units. This was before the days of radio communication, and I was not in a position to question any of the crewmen, who were too busy to answer questions, anyway. So to this day I am not quite certain why the crews picked the most difficult unit to swap. 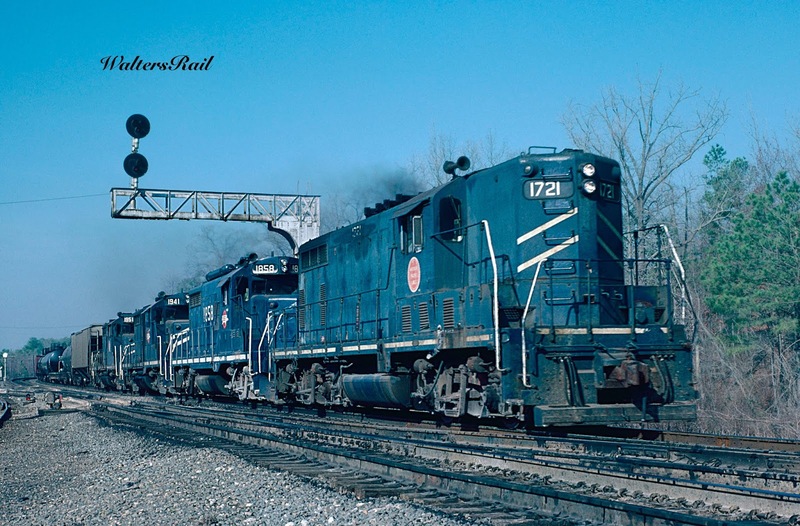 Nonetheless, both northbound trains eventually entered the siding and rolled past the southbound, which also eventually continued its journey south through Oklahoma. Here is the southbound with the additional MoP unit in the rear. And here is the northbound entering the passing siding with only three units. If you look closely at the rear of the coal train, you can see the light of the next northbound waiting to go through the siding. The northbound with three units is rolling past the stationary southbound with the additional MoP unit. 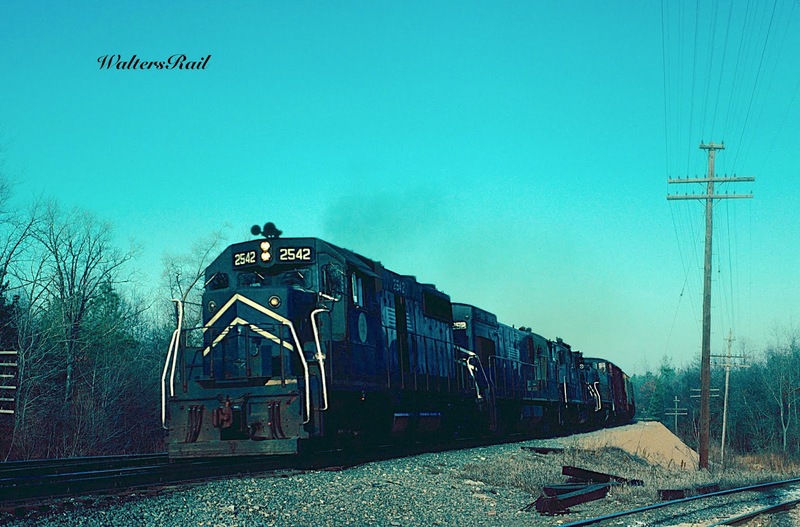 The second northbound rolls through the siding. 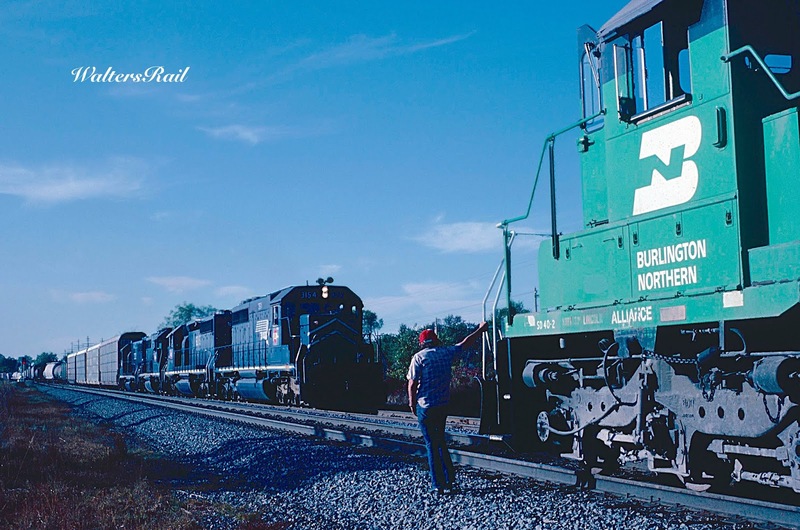 The second northbound meets the original southbound. Crewmen from two trains share a greeting. The original southbound finally gets underway. The whole process, if memory serves, which it often does not, took about three hours, long enough that the fair weather cumulus clouds present early in the day had almost completely dissipated when I took this image. In my early days of railfanning, I made frequent use of a map published by the Oklahoma Highway Department, which showed and identified all rail lines in the state, with one exception. 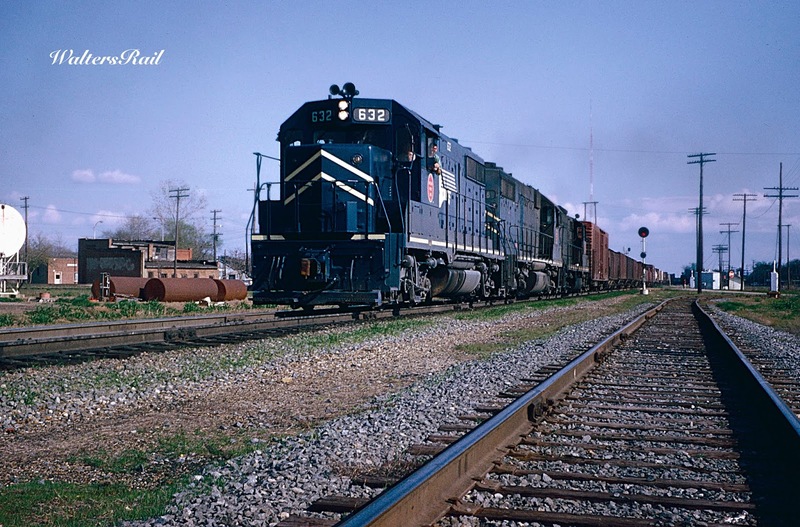 No identification was given to a line running southwest out of Muskogee to a crossing of the Red River north of Denton, Texas. I called this the “Mystery Line,” which I eventually discovered was the Kansas, Oklahoma and Gulf, part of the MoP system. The KO&G was formed in 1919 from the assets of the bankrupt Missouri, Oklahoma and Gulf Railway and served primarily as a bridge between the MoP in northeastern Oklahoma and the Texas and Pacific Railway (also controlled by MP) at Denison, Texas. This traffic was the main source of revenue for the KO&G and was the primary reason that the MoP acquired it. The line ran through some of the most isolated country in eastern Oklahoma. Often far from any paved road, the KO&G was very difficult to photograph. One somewhat accessible spot was Calvin, Oklahoma, at the junction with the Rock Island line from Oklahoma City to Little Rock. Another was just north of the bridge across the Red River, where the KO&G used traffic rights on the Missouri, Kansas and Texas Railroad. 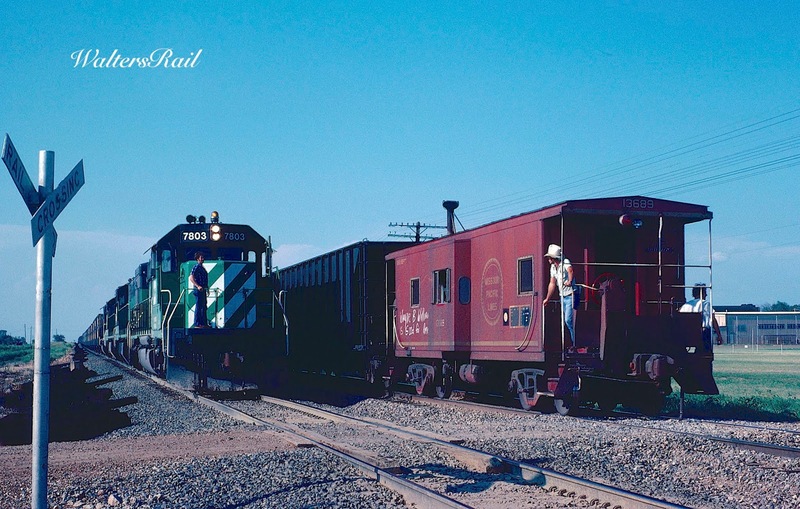 There was a passing siding in the tiny hamlet of Coleman, Oklahoma, where I was once able to obtain a meet shot. The main problem with photographing the line was a dearth of traffic – four to six trains every twenty-four hours, often running at night. The line ran roughly parallel to the Frisco and Katy lines through eastern Oklahoma. UP abandoned the KO&G shortly after acquiring the MoP and the Katy. 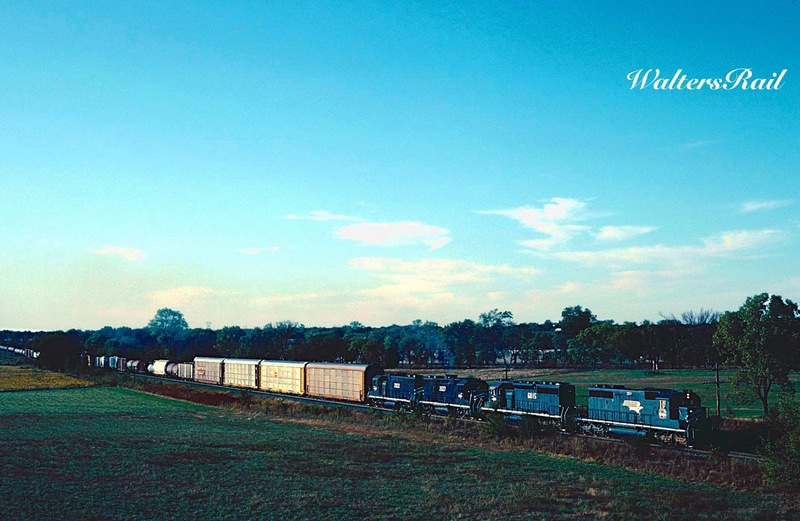 A northbound manifest approaches the Rock Island diamond in Calvin, Oklahoma. Two manifests meet on the old Kansas, Oklahoma and Gulf in Coleman, Oklahoma. 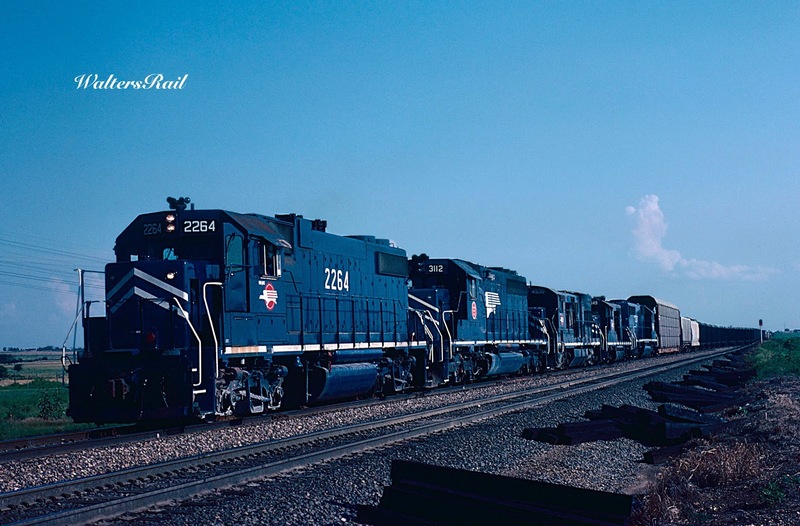 Southbound traffic on the "Mystery Line" is approaching Tupelo, Oklahoma. A southbound manifest is running on MKT trackage rights as it approaches the Red River bridge. There is actually a town in Oklahoma called “Okay,” on the Verdigris River in Wagoner County. Population in the 2010 census was 620, though I am uncertain how one would actually count most of the residents, since many of the dwellings are far back in the woods in places I would prefer to avoid. Okay, Oklahoma, is also the location of a single-track bridge across the Verdigris called, aptly enough, Okay Bridge. Years ago, the federal government, at the behest of Senator Kerr of Oklahoma and Senator McClellan of Arkansas, created a navigable waterway up the Arkansas and Verdigris Rivers, through Little Rock and Muskogee, to Catoosa Oklahoma. Called the “McClelland-Kerr Arkansas River Navigation System,” it fulfilled Will Rogers’ prophecy that someday “pork barrel” legislators would figure out a way to turn his home into a sea port. As part of the massive construction project, the KO&G and MKT lines to Denton were rerouted over a new, single-track bridge at Okay. Although traffic on both lines was sparse, a train from one company would occasionally wait on one side of the bridge while a train from the other line was crossing. A good hike was, and still is, required to reach the bridge, which is difficult to photograph because of high embankments. Although the KO&G line was abandoned years ago, Union Pacific operates the old Katy line to Texas, and everything crossing the bridge today is Armour Yellow. A northbound KO&G manifest rolls across the Okay Bridge. 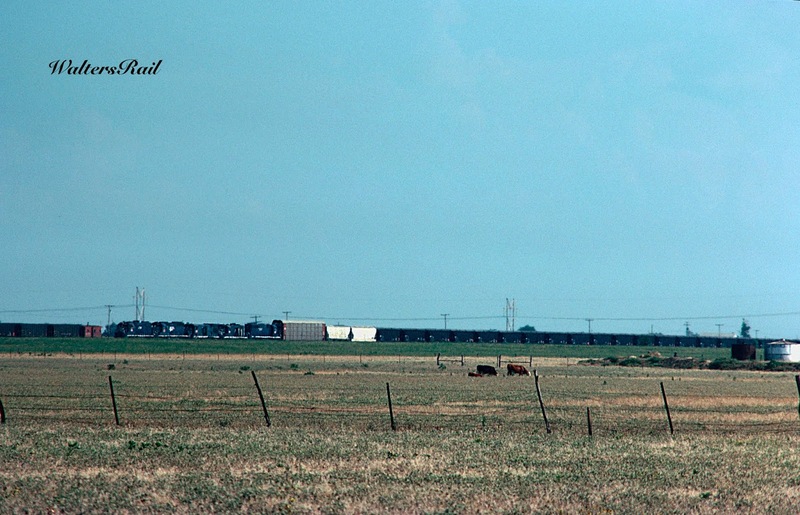 The track in the foreground belonged to the Missouri, Kansas and Texas (now part of Union Pacific). 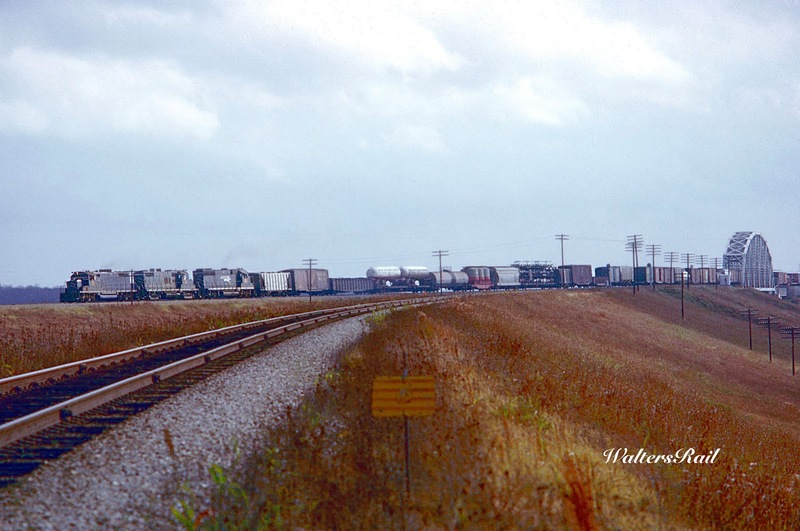 A MoP mixed freight waits patiently as an MKT grain train comes off the Okay Bridge and heads north to Muskogee. A northbound manifest approaches the Okay Bridge. A southbound MoP freight crosses the Okay Bridge on the way to Denton, Texas. A southbound MoP manifest has crossed the Okay Bridge and is rolling slowly down the tall embankment constructed by the Corps of Engineers. Here is a northbound on the same huge embankment. 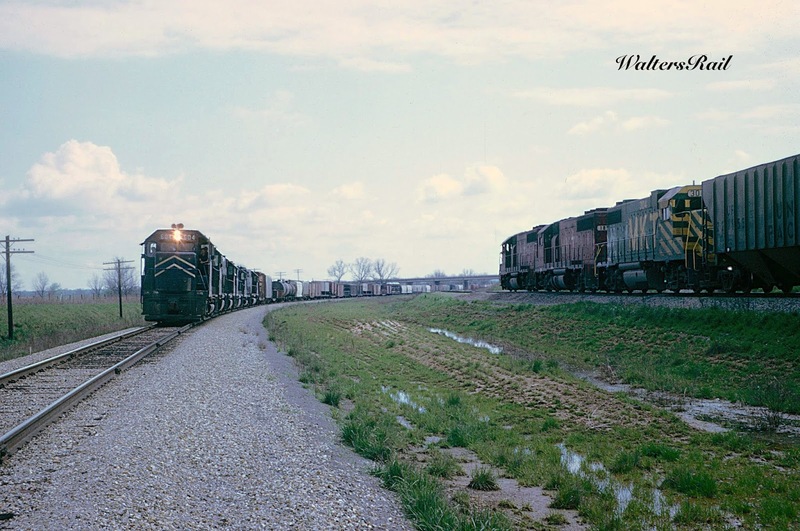 South of Coffeyville, the Wagoner Subdivision began an elongated curve to the southeast, where it ran north of the Arkansas River through Salisaw, Oklahoma, Van Buren, Arkansas, and on to Little Rock where is connected to the mainline running south from St. Louis. 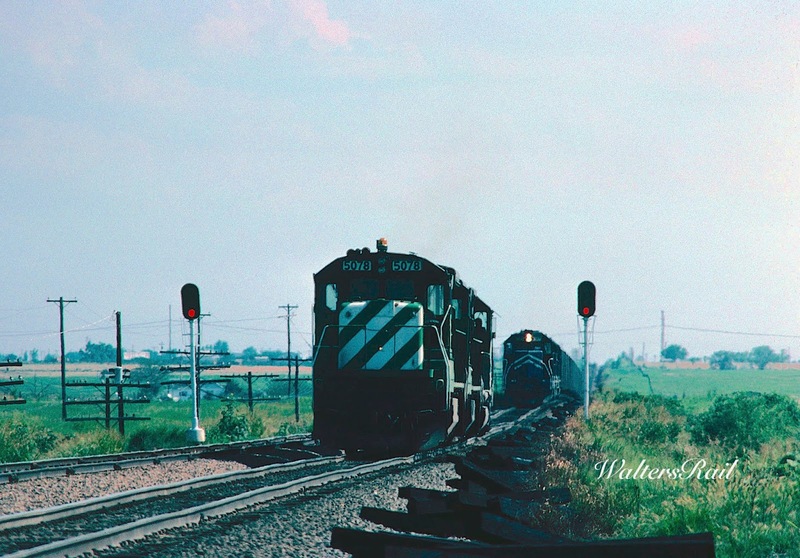 This subdivision ran through heavily wooded hill country and, like many MoPac lines in that part of the world, saw little traffic other than coal trains. In the days before ubiquitous radio communications, finding a train there was about 15 percent skill and 85 percent blind luck. 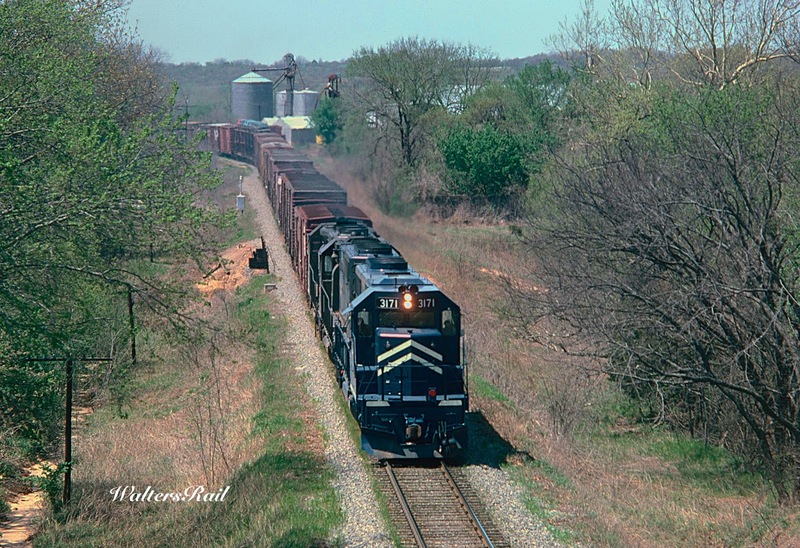 I was able to stumble onto trains south of Coffeyville, northwest of Sallisaw and east of Van Buren, two areas where highways ran fairly close to the tracks and foliage was not too dense. 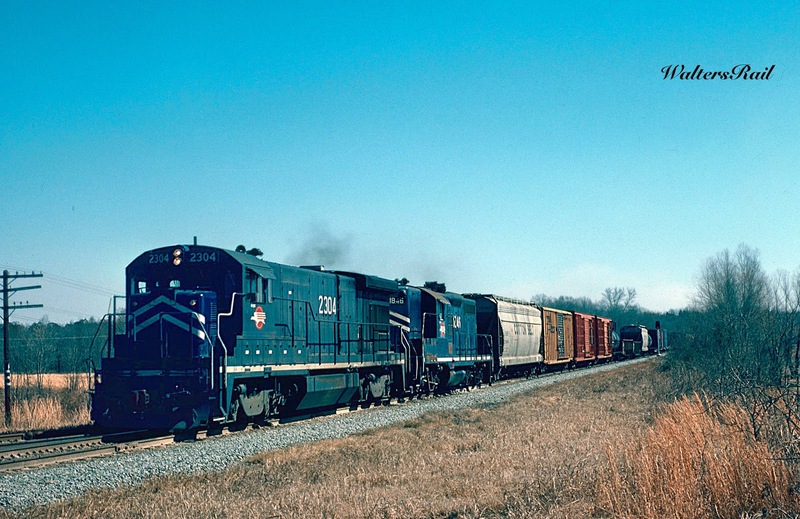 A southbound mixed freight is leaving Coffeyville, Kansas, at dusk. 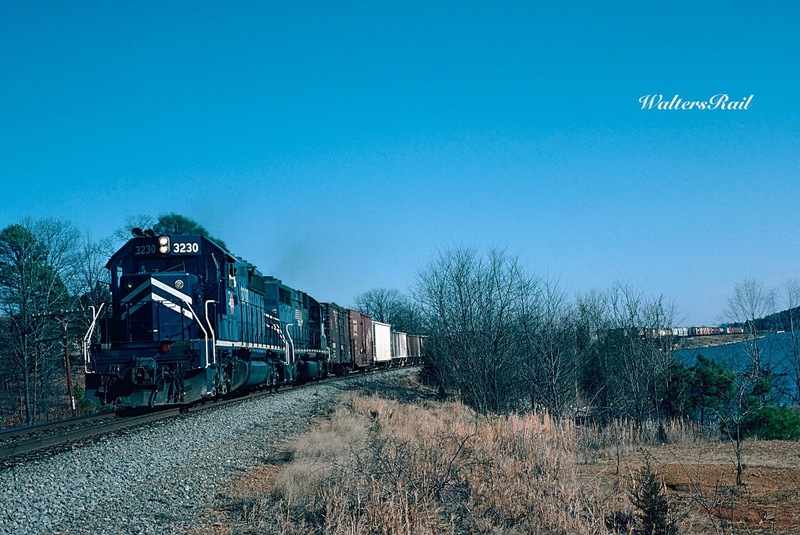 Another southbound mixed freight has just crossed the border into Oklahoma. 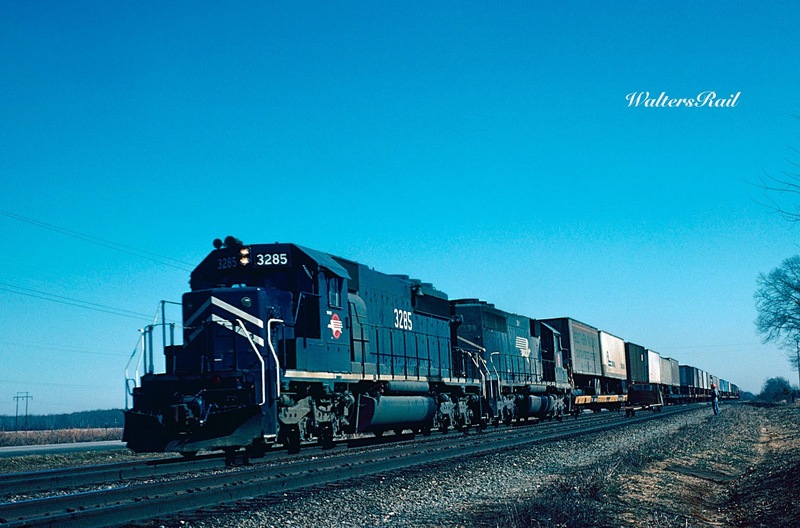 A northbound manifest roars through Wagoner, Oklahoma, where the MoP line to Little Rock and Denton, Texas, crossed the Missouri, Kansas and Texas. 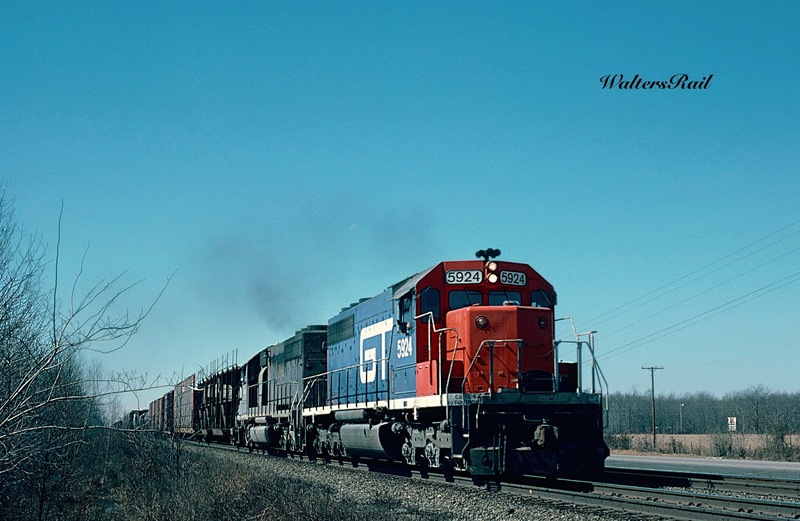 A northbound manifest has crossed the Neosho River and is approaching Wagoner, Oklahoma. 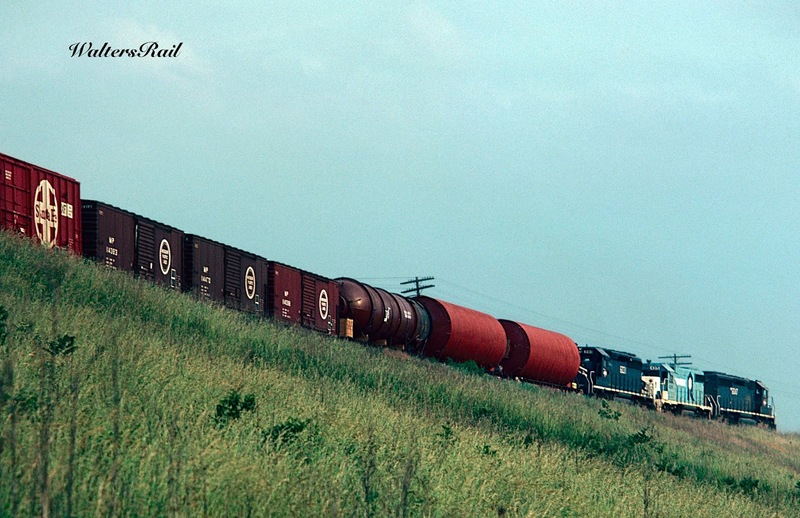 Here is the same train further southeast, approaching Sallisaw, Oklahoma. Four days later, this MoP manifest (about ten miles from the Oklahoma-Arkansas line and pulled by the same set of motive power as above) has made the big turn (covering over 100 miles) from south to east and is now rolling toward Van Buren, Arkansas. 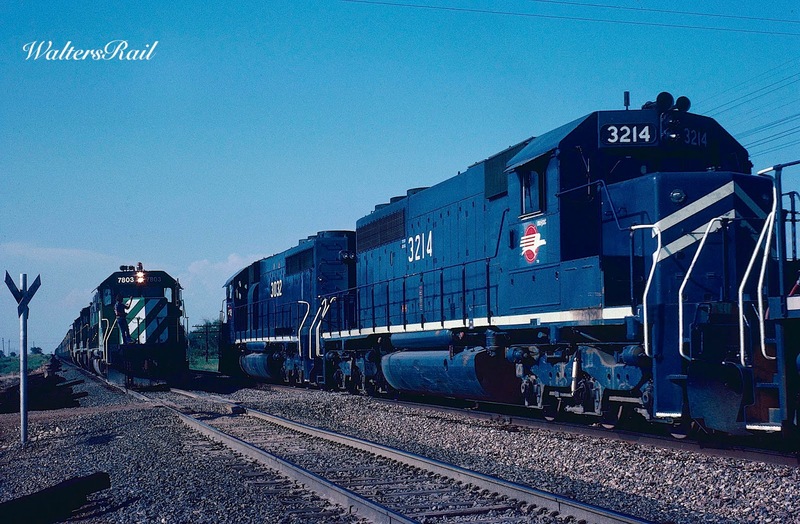 MoP 3230 North leads a Kansas City-bound manifest approaching Muldrow, Oklahoma. 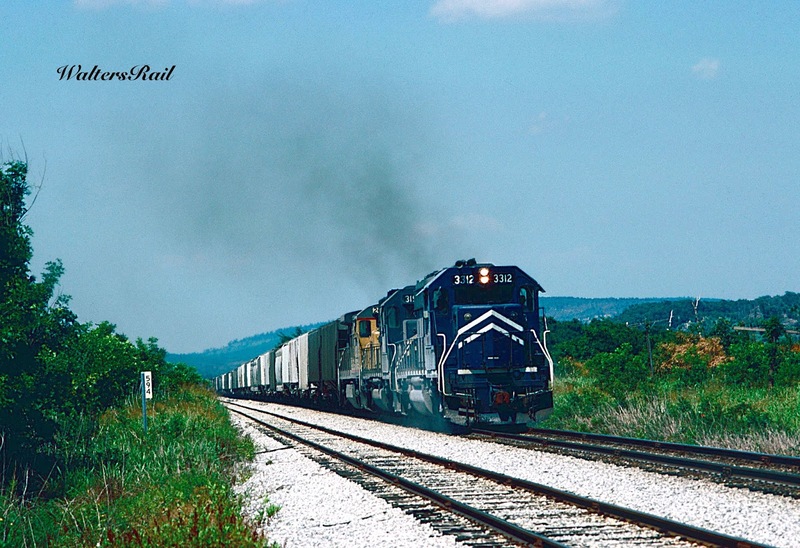 Here is the same train crossing the Illinois Bayou at Lake Dardanelle, west of Russellville, Arkansas. 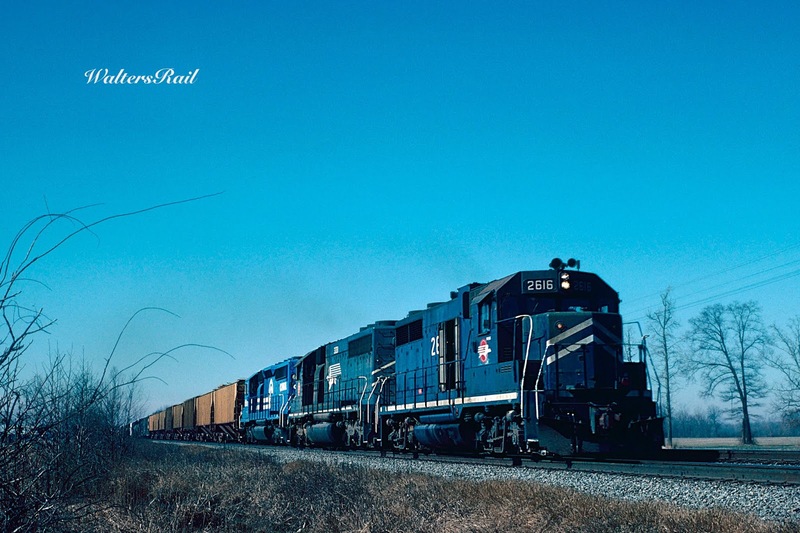 Around 1980, my wife and I were friends with a couple living in Arkansas, and during infrequent visits, I was able to shoot the MoP mainline north of Bradford, one of the busiest stretches of track on the railroad. The land there is flat farmland in the delta of the White River, with the Ozark Plateau to the northwest. 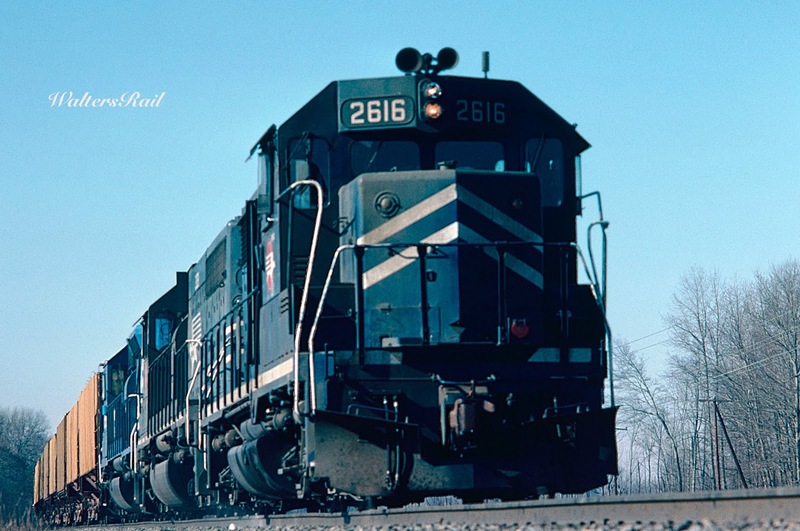 The MoP ran virtually every type of motive power in its stable down that stretch of double-track line (to the south, the line was single track); the mix was often quite interesting. 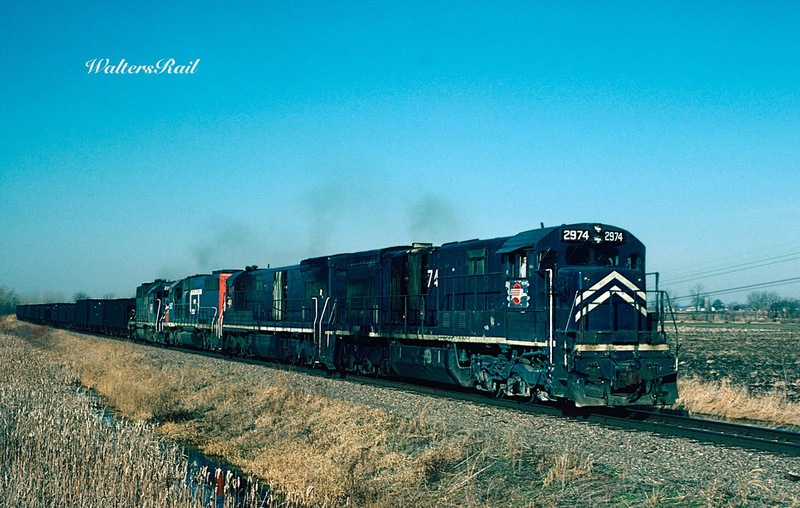 As late as 1980, it was not unheard of to see Geeps on the point of mainline freights, running long hood forward. 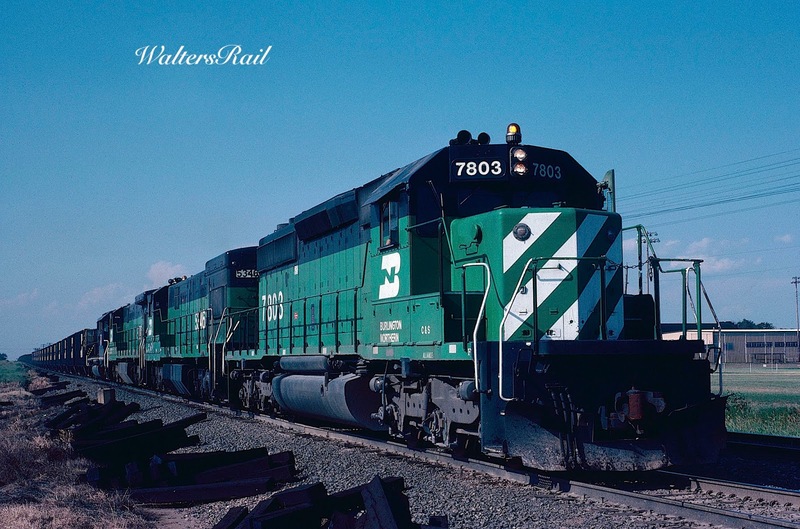 I also made occasional trips to Forth Worth, where the MoP maintained Centennial Yard and ran a large number of mainline and transfer freights through FW Tower. A massive freeway project has completely changed the look of the area north of downtown. Thirty-five years ago, some interesting shots were available, but all are obscured now by a gigantic freeway interchange. After the UP acquired both the MoP and the MKT, one would occasionally see MP power on the old Katy. 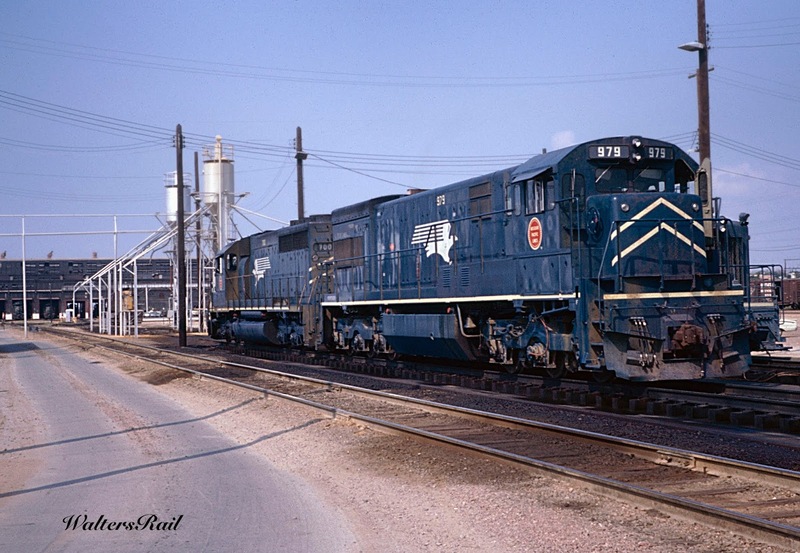 In 1986, I found such a train (a grainer) at Muskogee and followed it south through the better part of the afternoon, past Eufaula and McAlester, all the way to Stringtown. The first two units were MP blue, while the third was Armour Yellow. This was the only MoPac power that I photographed on the Katy. 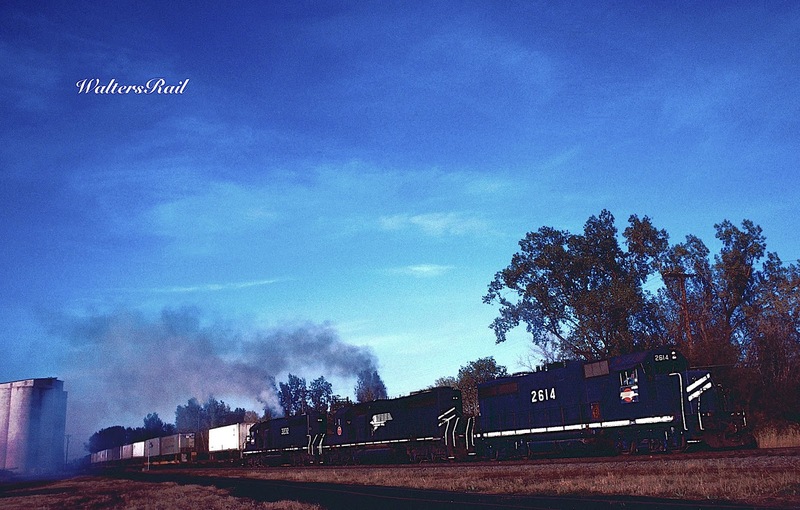 A southbound manifest approaches Bradford, Arkansas. 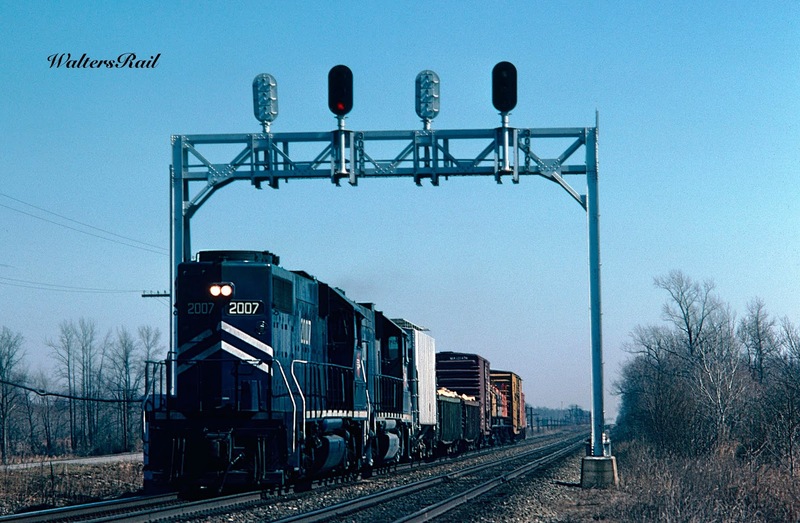 A northbound mixed freight, with Grand Trunk 5924 on the point, races toward Bradford. Southbound trailers pass a track worker watching for defects. Northbound grain is rolling toward St. Louis (actually Dupo, Illinois) across northern Arkansas. The same train as above. 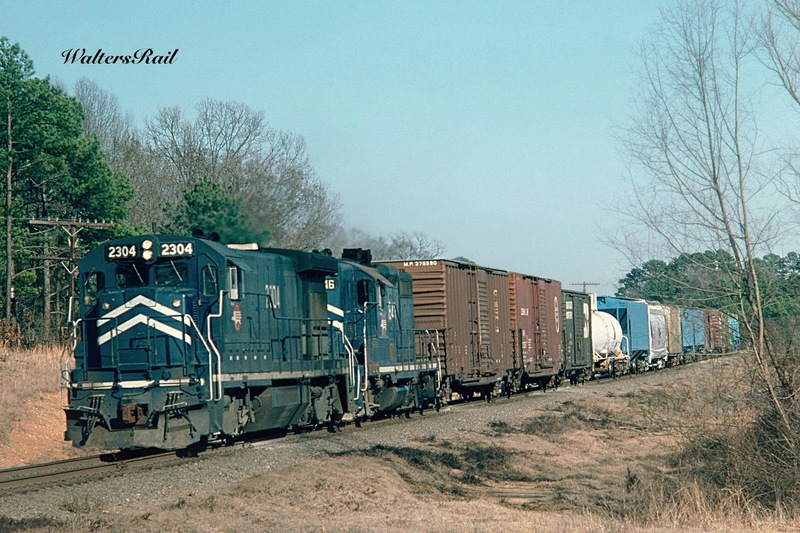 A southbound mixed freight has entered a passing siding south of Malvern, Arkansas. The line south of Little Rock is mostly single track and heavy with pine trees. This random image was taken on a family trip which did not allow time to wait for the northbound to arrive. 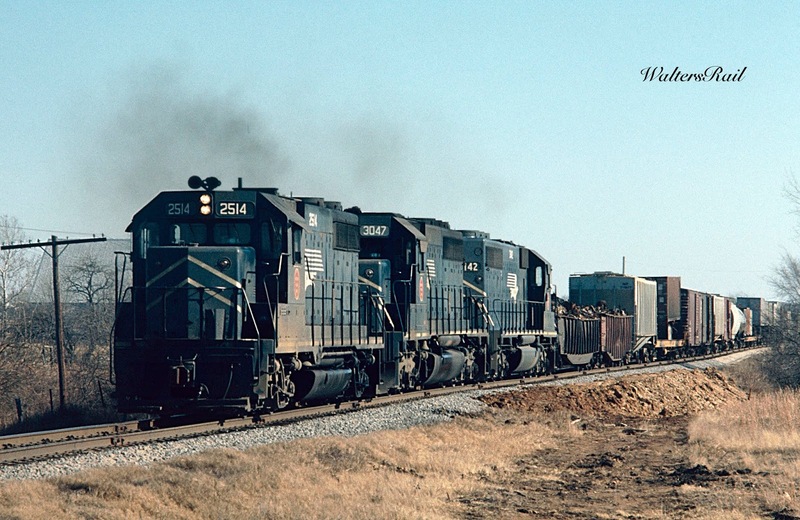 Two MoP yard switchers are moving through Fort Worth. The photographer is standing at the base of FW Tower. The tower still exists, though the interchange is completely covered by a gigantic freeway mixmaster. This image was taken with GAF slide film, which went out of production about 45 years ago (as of the date of this post -- October 2018). The color is still good! 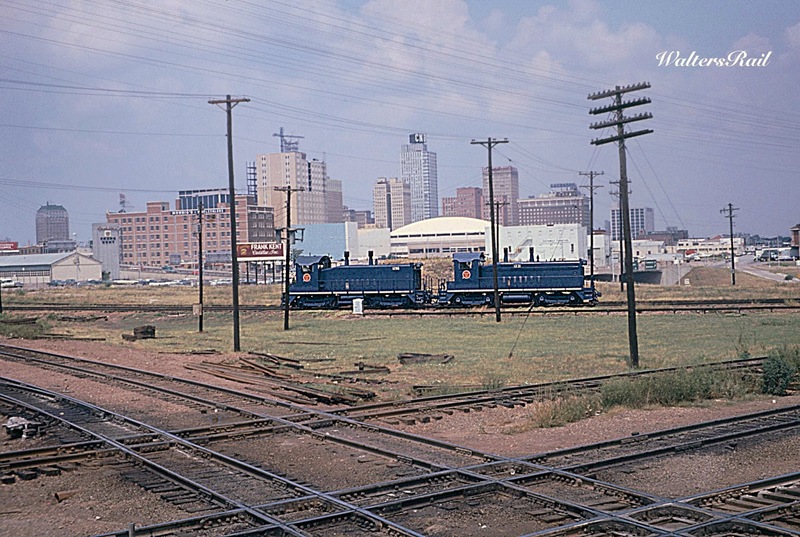 The engine terminal at Centennial Yard, Forth Worth Texas -- 1972. 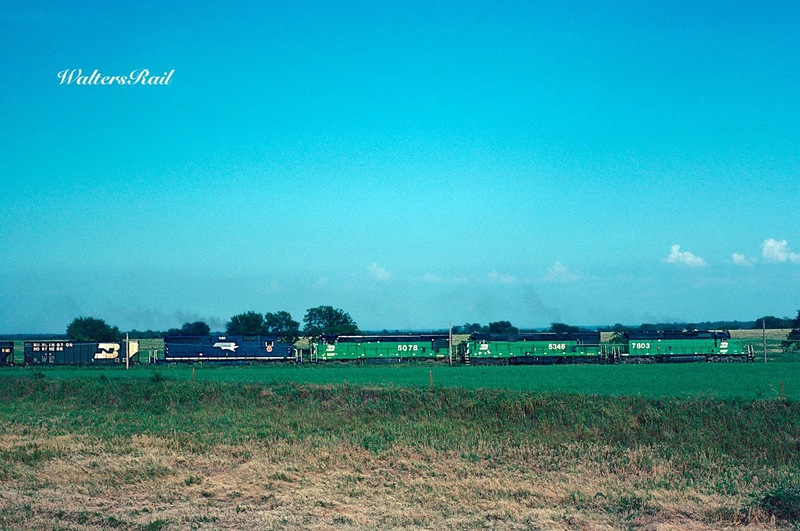 In June 1986, a UP grain train, led by two former MoP units, is rolling south of Eufala, Oklahoma, on the old MKT mainline. 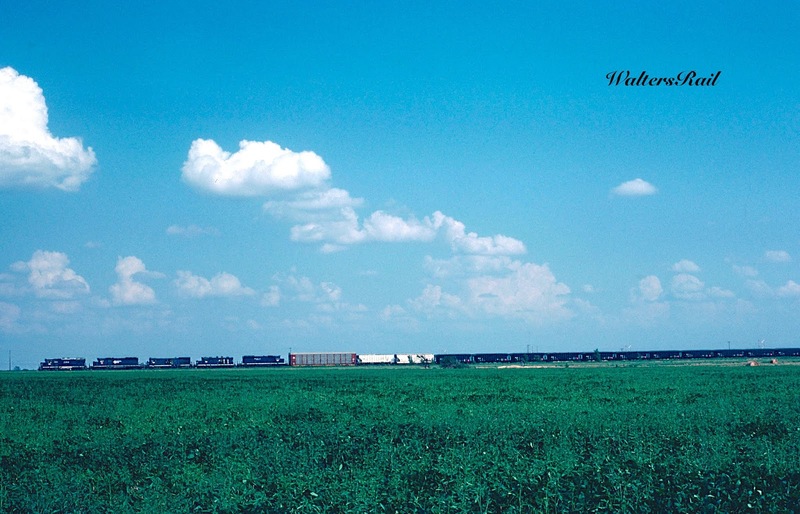 Here is the same train about 60 miles south at Stringtown, Oklahoma. My longtime friend Carl Graves has lived in Lawrence, Kansas, for many years. 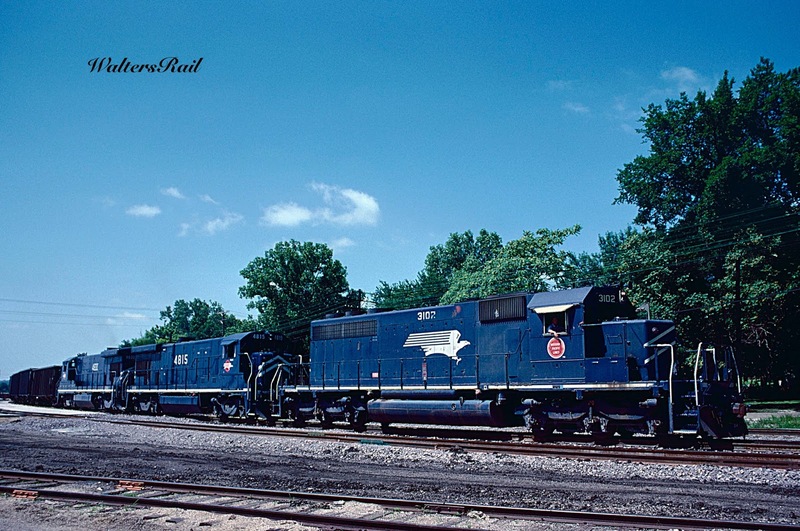 When he was still an active railfan, I visited him several times to shoot trains in the Kansas City area, a wonderful location for photographing the MoP -- the crossroads for five lines to Omaha, Pueblo, St. Louis, Little Rock and Fort Worth. In Kansas City itself, a great location for MoP photography was southeast of Neff Yard beside a grain elevator. Another good spot was along Metcalf Road just south of the city. According to Carl, the line (part of the Coffeyville Subdivision) has been relocated, and the shots I once took there are no longer available. One of the more obscure MoP lines (along with the old KO&G) was the Osawatomie Subdivision, which along with the Council Grove, Hoisington and Horace Subs, constituted the 563 mile line from Osawatomie, Kansas, to Pueblo, Colorado. Osawatomie (about 35 miles southeast of downtown Kansas City) was the dividing point for the western line to Pueblo and the southern line to Coffeyville. 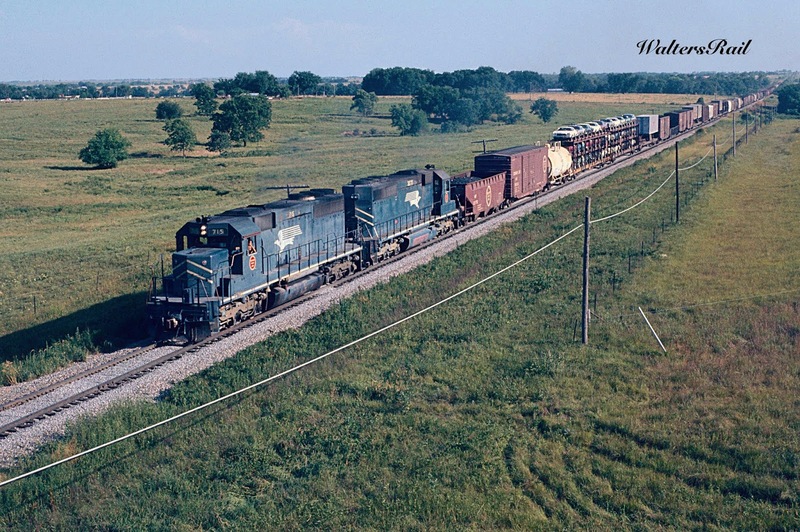 From Osawatomie, the Pueblo line turned northwest to Ottawa, Kansas, where it crossed the AT&SF Transcon, then ran side-by-side with the Santa Fe for several miles west of town. This line saw little traffic and, except for a 13.4 mile stretch of CTC on the west end, was ABS with hand-thrown switches. When the UP took over the MoP, almost all of this line was abandoned. The line from Kansas City to St. Louis was one of the MoP's busiest. Slightly west of Jefferson City, at Cole Junction, the double track mainline split, one line running northeast to Kansas City, the other running more or less due west to Sedalia, then Pleasant Hill, then turning almost due north toward the Missouri Pacific's huge Neff Yard east of downtown. 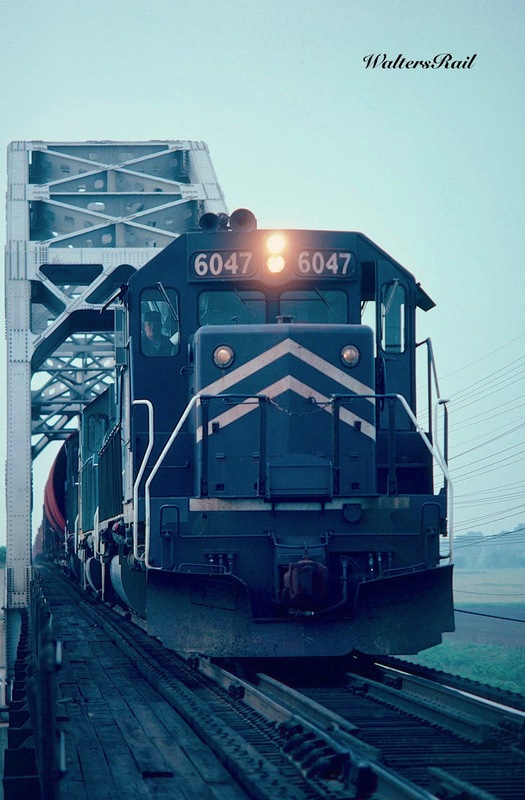 On the Coffeyville Sub, a southbound UP freight with MoP power rolls beneath the Metcalf Road overpass in June 1984. 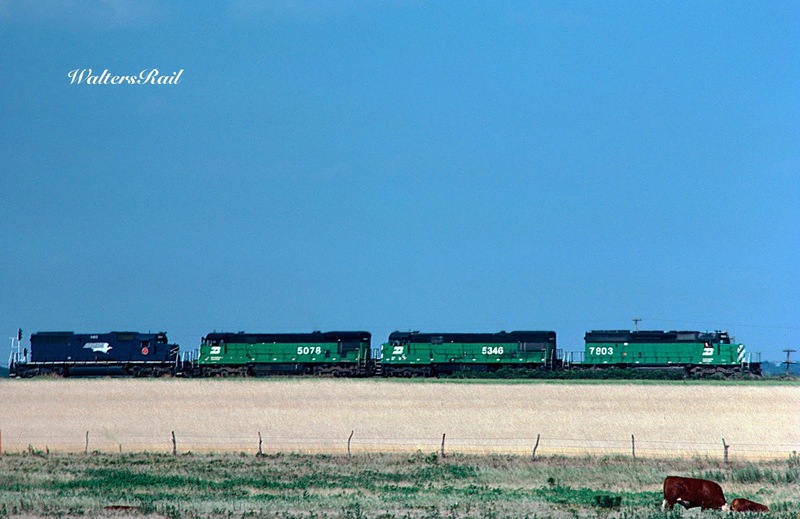 Three MoP units and one Grand Trunk roll an eastbound coal train just west of Ottawa, Kansas. The AT&SF mainline is just out of sight to the left. Here is the same location on a cloudy day. 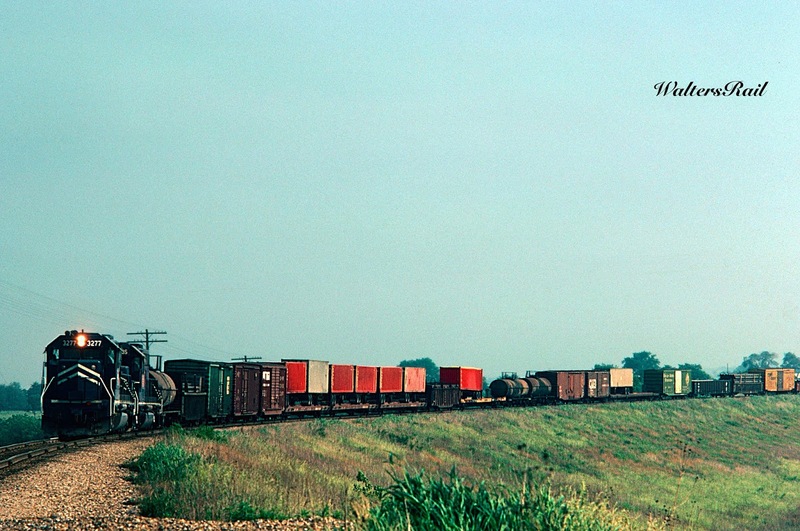 A westbound mixed freight rolls west on the Osawatomie Sub. 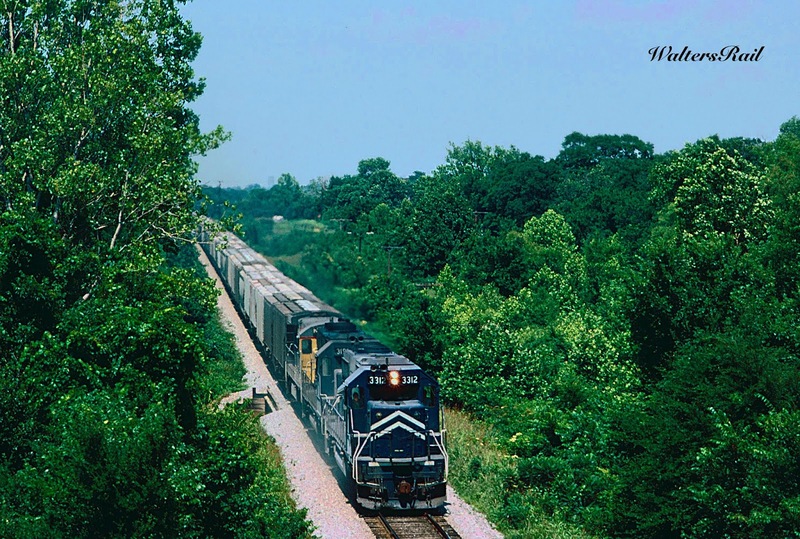 An eastbound mixed freight meets a westbound coal train on the Sedalia Sub at Pleasant Hill, Missouri. 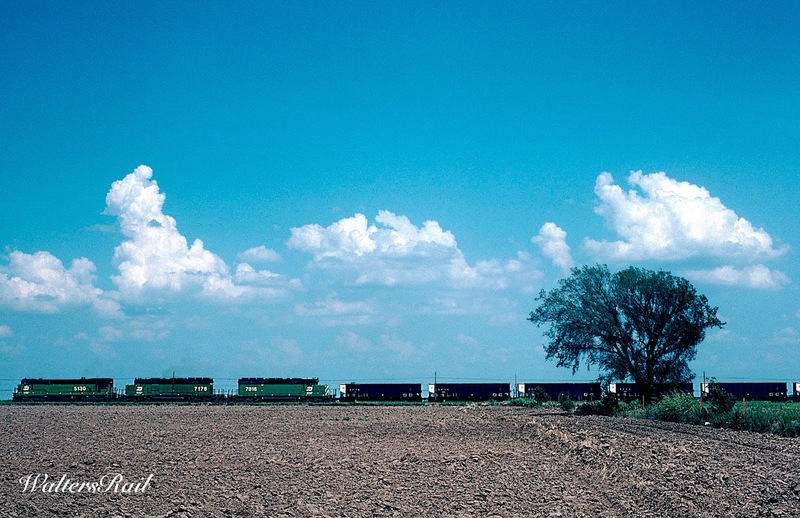 A southbound coal train at Osawatomie, Kansas. Thus ends my survey of the Missouri Pacific. 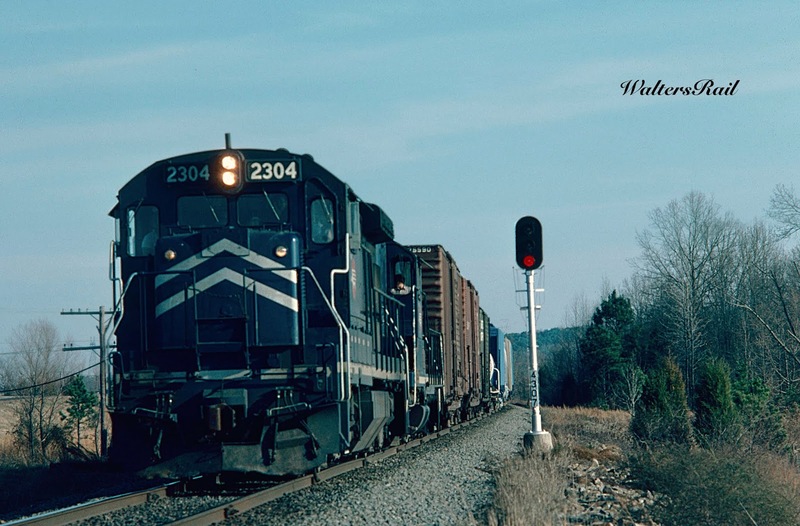 With the passage of many years, I have come to appreciate the railroad for its ability not only to survive hard times but also to prosper as other railroads in the mid-twentieth century fell down to degradation. So in the end, despite the sentiments of my youth, I do miss the Missouri Pacific. I wish it were still an independent railroad. Sunset on the Missouri Pacific.